Thousands of traffic accidents occur in intersections each year. In fact, about 40 percent of all motor vehicle crashes occur in intersections, according to a report by the National Highway Traffic Safety Administration (NHTSA). An intersection is a location where two or more roads converge, and any intersection can set the stage for potential conflicts between drivers who are trying to turn or cross traffic. Boston’s population density and mix of vehicular and pedestrian traffic amplify the risk of intersection accidents. Add self-driving cars to the mix of decision-makers governing intersection travel and the situation is likely to get worse before it gets better. Boston-area interchanges and their connecting roads may be managed by different agencies, which complicates tracking and efforts to reduce collisions. Complicating efforts to reduce intersection accidents is the fact that roads and their corresponding intersections may be managed by different agencies. 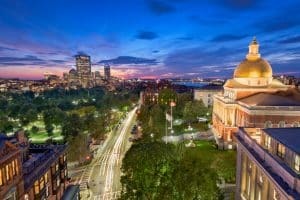 According to a Boston Globe article on some of the city’s most treacherous interchanges, intersections in the greater Boston area may be under the jurisdiction of a city or town, the Massachusetts Department of Transportation (MassDOT), or the state Department of Conservation and Recreation. These entities don’t always agree on problematic intersections or how to pay for improvements to make them safer. In 2016, MassDOT compiled a report listing top crash locations for passenger vehicles, bicycles, and pedestrians in an effort to spur safety improvements across the state. MassDOT also maintains an interactive map that depicts crash clusters in the Boston metro area and throughout Massachusetts. According to the 2016 MassDOT report, the intersection that averaged the most collision-based property damage in the greater Boston region was south of the metro area in Brockton. That city’s Pleasant Street-West Street junction logged 109 crashes between 2012 and 2014, most of which were non-injury accidents. Northwest of Boston in Lowell, the intersection at Bridge Street and Veterans of Foreign Wars Highway had 127 crashes during the same period, most of which were non-injury crashes as well. Another intersection in Lowell with similar crash figures is at Appleton Street and Central Street. The large intersection at Revere Beach Parkway and Garfield Avenue in Chelsea ranked 31st in the report; there were 69 motor vehicle crashes at this intersection between 2012 and 2014. In Boston proper, the intersection with the most motor vehicle wrecks is the interchange at Morton and Harvard streets, a location that recorded more injury crashes than non-injury accidents. The Boston intersections at Jamaicaway and Bynner Street, and Gallivan Boulevard and Dorchester Avenue also made the MassDOT list of the state’s 200 most dangerous intersections. 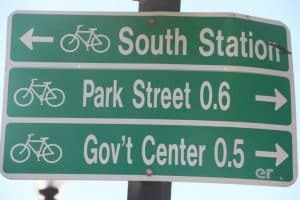 A Boston street sign highlighting bike routes. With a few exceptions, most Boston-area bicycle accidents are concentrated in Cambridge and Somerville. According to the Cambridge city website, approximately 9 percent of Cambridge residents bike to work. That number has been on the rise in the Boston metro area over the past several years amid efforts to ease traffic and support environmental initiatives. Unfortunately, bicyclists are still at risk, especially riding along Massachusetts Avenue in the region between Trowbridge Street and Columbia Street. Between 2005 and 2014, there were 306 bike-related accidents in this area, and about half of those accidents resulted in injury. Just east of Cambridge, in Somerville, thoroughfares that intersect Hampshire Street or Cambridge Street have high rates of accidents, as do intersections along Mass. Ave. from Everett Street to Milton Street. The most dangerous pedestrian intersections are in Chelsea, according to the MassDOT report, and are clustered around several streets intersecting Broadway from about Library Street to Tremont. Chelsea is the second-most densely populated city in Massachusetts, but it occupies the smallest municipal space. Cambridge also ranks high for pedestrian accidents, specifically on streets that intersect Mass. Ave. from about Hancock Street to Blanche Street. Cambridge has high foot traffic because of its proximity to Harvard University, M.I.T., popular museums, and other attractions. While it’s a good idea to exercise extra caution at these busy crossings, it’s also important to remember that accidents can happen at any intersection. If you were hurt or a family member was killed in an accident caused by another’s negligence, our attorneys are here to help. Jason Stone Injury Lawyers is the only firm to offer the Stone Cold Guarantee®. Call us today at 800-577-5188 or contact us online for your free consultation. For up-to-date information on issues related to personal injury law in Massachusetts, “Like” Jason Stone Injury Lawyers on Facebook and follow us on Twitter. Is Boston Ready for Driverless Cars?